UCI was able to lock in their first win of the season last Monday, edging Portland State 4-3 at Club Green Meadows in Vancouver. The ‘Eaters were unable to secure the doubles point, but won the top three singles matches as well as flight six to overcome the Viking charge. Juniors Hali Dickson and Ashlynn Hall prevailed for UCI in number three doubles with a 6-3 win, but the ‘Eaters dropped the other two matches as Portland State took a 1-0 lead. Freshman Constance Branstine evened things up at the start of singles play, notching her second win of the year at number one in dual matches after her opponent withdrew after a 7-5 first set went in favor of Branstine. Portland State retook the lead after Hall fell 6-0, 6-4 to Viking freshman Sally Partington at number four, but the score was tied again thanks to senior Cassidy Branstine’s 6-3, 6-2 triumph at flight three. Sophomore Taylor Rees of Portland State put her team back on top and one point away from clinching as she dispatched ‘Eater freshman Jacqueline Tsodikova 6-2, 7-5 in the number five match, but Dickson was able to knot the score at 3-3 after winning her number six singles match in straight sets 6-3, 7-5. The only matchup to go the distance was the deciding flight two game between Portland State senior Tracy Dong and ‘Eater freshman Stephanie Nguyen. Nguyen escaped the first set with a 7-6 (9-7) tiebreaker victory before succumbing 2-6 in the second. The third and final set went in UCI’s favor, as Nguyen was able to finish off her opponent 6-4 and clinch the ‘Eaters’ first win of the year 4-3. The women’s indoor track team sent 16 athletes to Dempsey Indoor in Seattle this weekend to compete in the MPSF Indoor Championships. Senior Megan George qualified for the 60m hurdle final on Friday, finishing second in her heat and seventh overall to advance. She would end up posting a time of 8.49, good for seventh in the final race on Saturday. Junior Persis William-Mensah won her heat in the 60m, but could not break through to qualify for the final on Saturday after her time of 7.49 put in her in 11th place. Senior Ariel Cheng cleared a personal record of 12-00.50 in the pole vault and finished at 24th overall, while junior Dazhana Bauer-Jackson’s 55-02 in the weight throw tied a season-high and was good for 13th. On Saturday, freshman Anastasia Karnaze set a person record in the mile with a time of 5:01.48, leading the team and placing her 36th overall. Senior Crystal Lizaola finished 19th in the 800m at 2:13.57, and senior Saniya Syed competed in the 400m for the first time this year, placing 43rd with a time of 59.75. UCI will prepare for the NCAA Indoor Championships in College Station, Texas on March 10-11. Although the ‘Eaters fell to a tough San Diego team 6-1 on Saturday, junior Luca Marquard was able to notch a win over #79 Filip Vittek at the Skip and Cindy Hogan Tennis Center. The sophomore duo of Mason Hansen and Luis Lopez knocked off their opponent in the flight one doubles match, but UCI dropped the final two to cede the doubles point to the 5-2 Toreros. Freshman Derek Chen, junior Andrew Gong and Hansen each lost their singles matches in straight sets to clinch the match for San Diego. Lopez brought his number two singles match to the third set, eventually losing in a tightly contested tiebreaker to Torero senior Joshua Page in a 4-6, 6-3, 1-0 (11-9) decision. Sophomore Vatsal Bajpai also pushed his counterpart to a third set, but also came up short to freshman Joel Gamerov in flight five 7-6, 4-6, 1-0 (10-7). The flight one matchup between Marquard and Vittek was the final decision of the day as Marquard edged the San Diego senior in the first set 7-5, before Vittek responded with a 1-6 drubbing in the second. Marquard was able to best Vittek in the tiebreaker with a 10-5 score, giving the ‘Eaters their only point of the match. The ‘Eaters began the Tony Gwynn Classic with a flash of dominance with an 18-4 pounding of Notre Dame at Tony Gwynn Stadium on Thursday night. The UCI bats compiled 19 hits to manufacture their 18 runs, which is their highest since putting up 20 against Grambling in 2011. Junior Keston Hiura broke open a 1-1 tie in the third inning with a three-run blast to center and finished 2-5 with three RBI and two runs scored. Freshman Christian Koss led both teams with four RBI, while seniors Mikey Duarte and Evan Cassolato and junior Parker Coss contributed a pair of RBI each. Cassolato reached base in all five plate appearances with four hits, and senior Adam Alcantara had three hits extending his streak to 20 games. In his second career start, senior Sean Sparling got the win, giving up only two earned runs on over 5.2 innings and striking out six. UCI could not parlay their offensive success into their matchup with Oregon on Friday, but still managed to plate five runs including thanks to another jack from Hiura and Duarte’s first career home run in an 11-5 losing effort. Alcantara’s hitting streak now sits at 21 games after he doubled in the first and scored on a sac fly by junior Cole Kreuter. Although the ‘Eaters jumped out to a 3-0 lead, the Ducks displayed some power of their own and clubbed two round-trippers in the fourth to tie the game 3-3. The UCI pitchers struggled, allowing 16 hits and 11 earned runs while walking six in addition to giving up the three home runs to Oregon. A 6-0 first inning helped the Toreros to take control of the Saturday morning game, as UCI would fall to the host team 14-6. 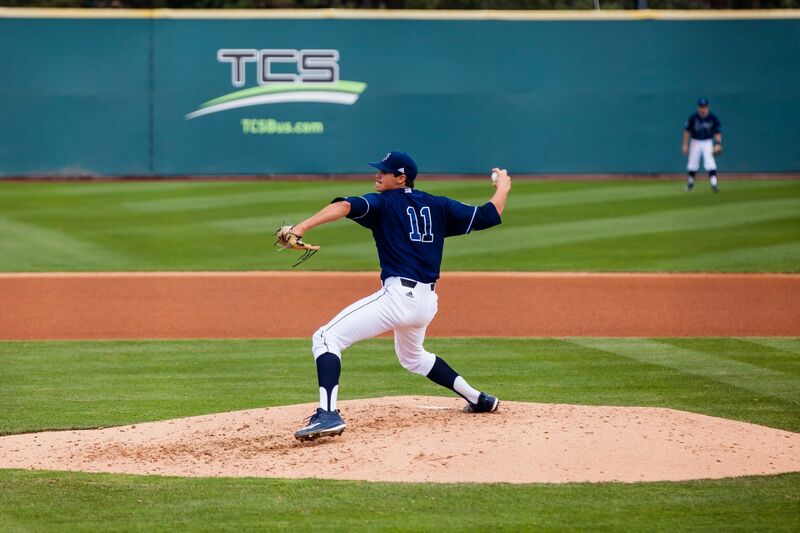 Junior pitcher Louis Raymond was unable to find his rhythm and was touched up for the six first innings runs in only 0.2 innings before freshman Kaz Akamatsu entered the game in relief. Akamatsu was responsible for two earned runs in one inning of work, and junior Alonzo Garcia who allowed four more earned runs in the next inning before the ‘Eaters were able to shut off the faucet. Juniors Michael Martin and Shaun Vetrovec stepped up to work 2.2 innings apiece and each gave up only one earned run. Alcantara stayed hot and pushed his hitting streak to 22 games, scoring twice and registering two hits as did Hiura and Koss. The ‘Eaters could not end the weekend on a high note, blowing a 5-1 lead and allowing the Volunteers to take the game in walk-off fashion. With two outs in the bottom of the eighth, Tennessee scored the go-ahead run and the umpires ruled that the game had surpassed the time limit giving them the 10-9 win. Hiura blasted his fourth home run of the year and his three-run shot gave UCI the 5-1 lead in the second inning. Senior starter Calvin Faucher was pulled in the third inning, and freshman reliever Cole Spear gave up five straight hits along with the lead. The lead changed hands several more times as sophomore Jordan Bocko stepped in to contribute an effective five innings, before the time limit was reached and Tennessee escaped with the narrow victory. Cassolato and Duarte scored three runs and knocked three hits each, while Hiura and Kreuter both notched three RBI-games. Hiura is currently slugging a ridiculous 1.074 with four home runs and 15 RBI on the young season, with nine of his 12 hits going for extra bases. The ‘Eaters move to 3-4, and are back in action next weekend hosting Portland at Anteater Ballpark. UCI hosted the Barbara Kalbus Invitational this weekend, and played four games against quality competition as nine of the top 10 teams in the country and 16 of the top 22 make up the field. Senior Kelsey Thornton scored the first two goals as UCI took an early 5-0 advantage and led 6-1 by the end of the first quarter against #12 San Diego State on Friday, as the ‘Eaters prevailed in the Think Pink game 14-10 at the Anteater Aquatics Center. Thornton would finish with four goals, junior Mary Brooks scored three, and senior Gabby Pierandozzi and junior Corinna Toledo contributed two each. The Aztecs trimmed the ‘Eater lead in the second half, scoring four unanswered to make it 10-7. Brooks would finally stop the bleeding with a last second goal in the third, and each team posted three goals in the final period to produce the 14-10 final. The #3 Bruins stormed into the Anteater Aquatics Center on Saturday, torching the ‘Eaters with 16 goals to only one from UCI. Sophomore Cara Borkovec was able to put the home team on the board in the second quarter, as UCI trailed 11-1 by halftime. UCLA added five more in the second half, as 10 different Bruins were able to register a goal, led by senior Alys Williams with three. UCI rebounded from their earlier loss to complete a 9-8 triumph over the #7 Rainbow Wahine later in the day on Saturday. Brooks and Thornton each posted three-goal games, while sophomore Jenna Phreaner was able to collect 11 key saves. After a 2-2 first quarter, the ‘Eaters won the second to go up 5-3 heading into halftime. After Hawai’i tied it up at 6-6 in the fourth, Thornton connected on two straight goals to take a commanding lead. The Rainbow Wahine drew within one, but senior Cambria Shockley slammed the door with the game winning goal with just over a minute remaining to give the ‘Eaters the 9-8 win. #5 Arizona State capitalized on a six-goal third quarter to swing the match in their favor over UCI in the fifth-place game on Sunday, prevailing 12-7 in the ‘Eaters final match. Thornton again led the team with two goals, with five other ‘Eaters contributing a goal apiece. A goal from Brooks tied the match late in the second quarter, as the score was knotted 4-4 going into the half. The Sun Devils immediately netted three unanswered scores in the third quarter, winning the period 6-2 as they took a 10-6 advantage into the fourth. ASU was able to cruise to a 12-7 victory and snagged the fifth-place finish. After splitting the weekend matches, the ‘Eaters are now 9-6 on the year and look forward to the Michigan Wolverine Invitational next weekend.